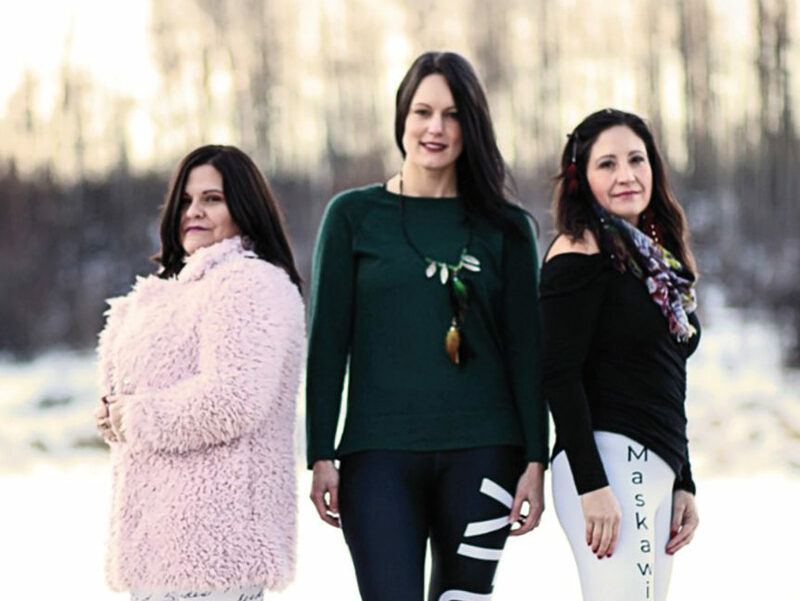 Her first major inspiration was a handwritten text with the writings of her late Kohkum (Cree for grandmother), which she incorporated as a print on leggings. Then, Morin went on a linguistic journey to find other meaningful words and phrases from Cree and Mohawk ancestry to use on her pieces. She designs her pieces digitally, combining simple silhouettes with different linguistic accents, photos and art to create the final products. “I’m still coming to terms with being called a designer, because I identify as a journalist, but also as a storyteller. I’m telling a story through what I’m creating,” says Morin. Mixed Blood Apparel has taken off in a way Morin never anticipated. Just two weeks after launching the brand, her t-shirts appeared in an exhibition feature at Otahpiaaki Fashion Week, an event that showcases the works of Indigenous designers, artists and creatives. Morin donates a percentage of her sales to different initiatives that align with the brand’s values, including the Native Women’s Association of Canada, the Indigenous Language Institute in Santa Fe, and the United Nations Refugee Agency. Particularly since the United Nations declared 2019 the Year of Indigenous Languages, Morin is passionate about the potential impact of her pieces. “I don’t think we have a year to wait for awareness and to help revitalize languages,” says Morin. According to the United Nations, 3,500 of the world’s 7,000 languages are in danger of going extinct over the next several generations.